Taking place over the next 12 months ‘Ageing with Pride’ will seek to bring much needed visibility to members of the LGBT community who are aged 50 and over. Using outdoor media such as billboards, bus stop shelters and bus posters, as well as digital marketing such as social media, we aim to spread our message far and wide. We’ll also be working with local media partners such as Midland Zone, and what’s On magazine. This is a big campaign that can do a lot of good in Birmingham and maybe even further a-field. generations in order to dismantle ageism, and the third ‘Continue the Journey’ seeks to galvanise older LGBT people to continue to engage in activity and fight isolation alongside their peers. We’ll be keeping you updated on the progress of the campaign through monthly blogs, and via social media. 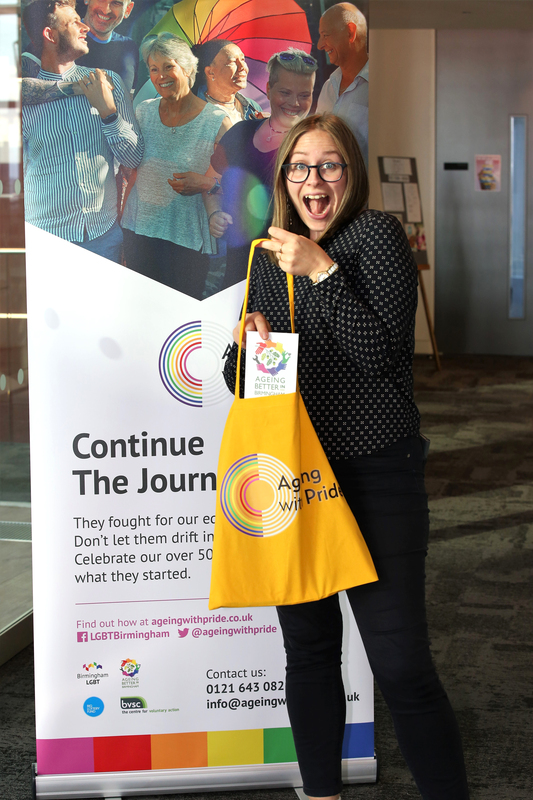 Follow us on Twitter at @ageingwithpride. Last month we had our partners launch, sponsored by Gowling WLG it presented a fantastic opportunity for us to thank everyone who made the campaign possible. Speeches from all key partners were made, and the first short film was unveiled. We’ve since started on outdoor activity as well as attending community events with promotional materials such as trolley coins, posters, tote bags and t-shirts. We’re really proud of the work Ageing with Pride is doing!